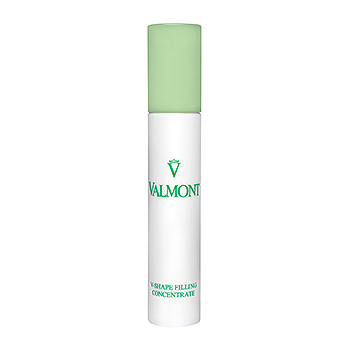 Valmont AWF5 V-Shape Filling Concentrate has the following features: This sculpting serum helps transform and tighten skin with its rich and creamy texture, addressing the look of sagging skin. Strengthens skin barrier from within while enhancing face volumes. Water (Aqua), Glycerin, Isononyl Isononanoate, Methyl Gluceth-20, Ascorbyl Tetraisopalmitate, Polyacrylate-13, Calcium DNA, Copper Lysinate/Prolinate, Disodium Acetyl Glucosamine Phosphate, Helichrysum Stoechas Extract, Lactic Acid, Lactose, Lecithin, Magnesium DNA, Methylglucoside Phosphate, Palmitoyl Tetrapeptide-7, Palmitoyl Tripeptide-1, Rna, Sodium Dna, Sodium Glucuronate, Urea, Whey Protein, 1,2-Hexanediol, Butylene Glycol, Caprylyl Glycol, Carbomer, Citric Acid, Disodium EDTA, Magnesium Sulfate, Polyacrylate Crosspolymer-6, Polyisobutene, Polysorbate-20, Polysorbate 80, Sodium Hydroxide, Sodium Lactate, Sorbitan Isostearate, Sorbitan Olyeate, T-Butyl Alcohol, Chlorphenesin, Ethylhexylglycerin, Phenoxyethanol, Fragrance (Parfum), Benzyl Benzoate, Benzyl Salicylate, Cinnamyl Alcohol, Citral, Citronellol, Eugenol, Geraniol, Hexyl Cinnamal, Hydroxycitronellal, Limonene, Linalool.